Women all over the world have been having healthy babies safely for hundreds of thousands of years in many different and extraordinary scenarios, but as technology has improved in countries like the United States, the sharp contrast between birthing conditions here and in developing nations has become even more apparent. That's especially the case in war-torn countries, as NPR explores in a piece about the role of midwives in conflict zones around the world. We did not have running water, we did not have 24 hour electricity. In the hospital where we worked...we ran a small generator. So we had a generator that we could use for lights in the operating room. But we did not have lights where we delivered babies vaginally. And we did not have running water. So we would have giant...tanks. Almost like a mini-cistern set up in the corner of the room so you could run water out of that and that would be refilled on a daily basis from water that we treated and brought up from the river. And we didn't have light. We used kerosene a lot, kerosene lanterns. I tried to bring headlamps sometimes but those batteries would always fail so they weren't very reliable....we had an autoclave, like a...useful but limited...sterilization system where we could heat instruments up and steam clean them. 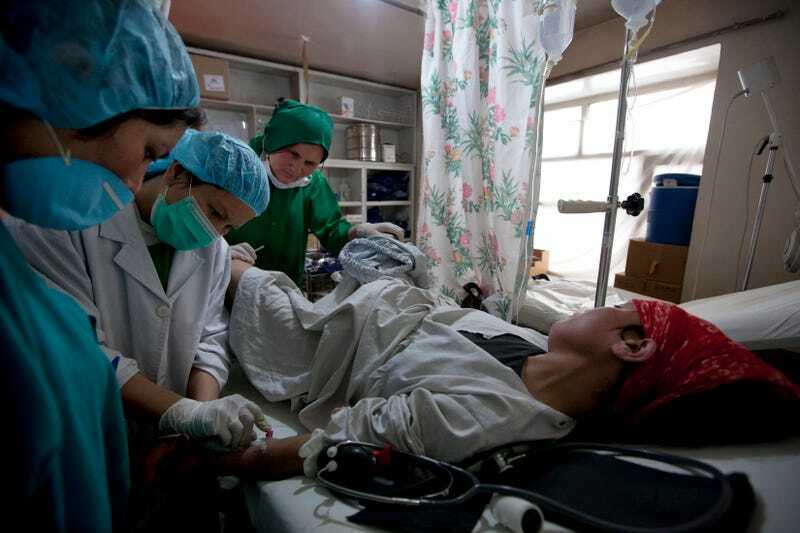 In many developing nations, there's a shortage of midwives, a problem that's heightened in nations caught in the middle of long periods of conflict. A lack of midwives isn't a problem that's just limited to birthing babies; it means that there's also limited information available about birth control. Plus, small amounts of medical aid flowing to these areas means that in countries like Syria, there are basically no hospitals available for women who have complicated births and in countries like Afghanistan, mother and infant mortality has been so high the country found themselves bucking tradition and training more women in the field. Doctors Without Borders reports that at the end of 2012 and beginning of 2013, "medical teams have seen an abnormally high number of miscarriages and premature births among their patients, more than 30 in December and January alone. This is due to the stress generated by the conflict." Of course, these problems aren't limited to nations that are war-torn. A 2011 paper from the United Nations Population Fund entitled the State of the World's Midwifery Report isolated countries that needed the most help in bettering their midwifery options; top nations included Cameroon, Chad, Ethiopia, Guinea, Haiti, Niger, Sierra Leone, Somalia and Sudan. All of those nations were labeled as places that needed to increase the number of midwives by six to 15 times what they have now. That same report estimated that if the 58 total countries noted improved their services, "as many as 3.6 million maternal, foetal and newborn deaths per year could be averted if all women had access to the full package of reproductive, maternal and newborn care." That's something that is being combatted by companies like Johnson & Johnson, which recently funded a scholarship program in Ethopia to train new midwives. Unfortunately, those approaches are piecemeal and in nations that are in the middle of seemingly endless upheaval, they don't provide much relief to the majority of women either working as midwives or the women who need them. It is nice, however, to see that despite how "hip" they are in the United States right now, midwives are also recognized for the tireless lifesaving work they do all over the world, in places where mentioning the The Business of Being Born to someone would get you a quizzical face in response.